You can challenge an individual's petition for a name change and possibly persuade the court to rule against the request if you have proper legal grounds for your objection. For example, if you know the person owes a debt or a warrant has been issued for his arrest, you can object to the name change on grounds that the petitioner is attempting to commit fraud or evade the law. Contact the clerk of court in your local courthouse for a list of the grounds you may use to contest a name change. If you have a valid objection to the proposed name change, you must follow your state's procedure for notifying the court. You can often locate these guidelines on the local court's official website or by contacting an attorney in your area. In some states, you cannot simply arrive in court on the date of the hearing and state your objection because not all states require a hearing for name changes. Maryland and Alaska, for example, require anyone who has an objection to a proposed name change to file a formal affidavit with the court stating the reasons for the objection. If your state requires you to state your objection in an affidavit, you must serve the person requesting the name change with a copy of the affidavit in accordance with your state's rules for service of process. If your state does not consider certified mail proper service, you can often request that an officer of the court serve the affidavit for a fee. After the affidavit has been served, you must file a copy with the court. The judge will then consider your objection when ruling on the individual’s petition for a name change. If a hearing is not required and you want the court to schedule one, you can typically make that request in your affidavit. Objections to name changes are often filed by noncustodial parents when the custodial parent attempts to change the last name of a minor child. The custodial parent must formally serve the noncustodial parent with notice of the impending change. If you are the noncustodial parent and you object to the change, you must notify the court of your objection. The law varies from state to state, but the court will generally schedule a hearing when a parent objects to a name change. At the hearing, the judge will give both parents the opportunity to state their cases before deciding if the name change is in the child’s best interests. How Do I Legally Change My Name in Ohio? Georgia residents can change their legal name with a petition filed in their local superior court. State law also requires publication of the petition, as well as a final hearing, at which the court may hear and decide on any objections to the name change. The process takes 30 to 60 days in most cases and entails the preparation of a simple legal document and the payment of court fees. What Does a Name Change Hearing Consist of in Civil Court? Your given name is selected by your parents but reflects on the person who bears it: you. All states recognize the right of an individual to change her name for almost any reason, yet most seek to eliminate applicants with fraudulent motives or those whose proposed new names could cause problems for others. 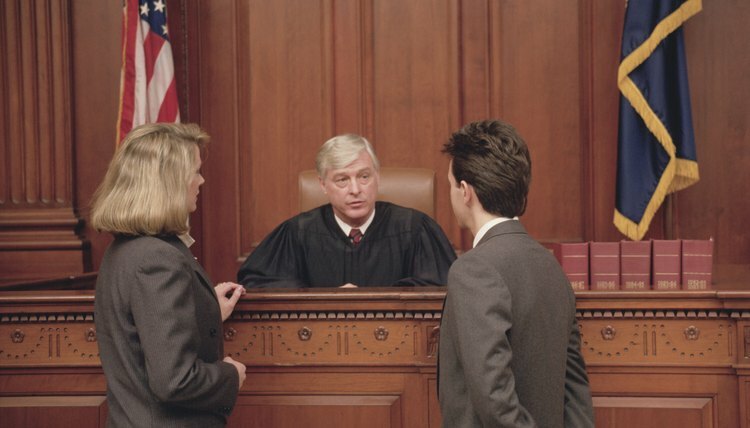 A name change hearing in civil court is the judge's opportunity to weigh these factors by asking questions directly of the name-change applicant.